The past 2 and a half months have been rife with cross country wedding preparations; although our wedding was in Vancouver we received an overwhelming amount of love and help from my family in Ontario, Ian’s family in Seattle and my friends and co-workers in Vancouver. It was so incredible to have so much hard work culminate in what can only be described as a night out of a dream. Our venue was at the Vancouver Maritime Museum which overlooks the ocean and the city skyline and the combination of a picture perfect sunset, dancing with glowsticks, and the people I love most together all at once made me feel euphoric and very absolutely loved and in love. Best of all, and most pertinent to this blog, is that we made all of our own food for the wedding. For the main meal we made watermelon and feta salad, Greek salad with fennel, an Asian inspired slaw with Daikon radish and Napa cabbage, gingered orzo salad with Shiitake mushrooms and spinach, and roasted chimichurri baby potatoes served at room temperature. For protein we did salmon marinated in soy, chicken breasts with lemongrass, and sausages. I served cheese, charcuterie, and crudites for an appetizer and my FANTASTIC pastry chef friend made our desserts; homemade oreos, Earl Grey shortbread, fruit tarts, white chocolate cranberry biscotti, and cherry squares as Ian and I’s wedding gift (which leaves me shaking my head in a “how do I have such amazing people in my life?” kind of way.) None of these amazing food feats could have been achieved if it hadn’t been for the super efficient and talented chef/caterer/bar tender team that I hired for the night, their help was invaluable and I couldn’t have done it without them. I know that mid-August might not seem the most appropriate time to be roasting vegetables in the oven, I admit to using the stovetop or my brand new wedding present toaster oven, but you could even grill them on the barbeque for a smokier take on this favourite dinnertime staple. The cooking method isn’t crucial, what’s important is that you reserve the deliciously gamey liquid left over after cooking the portobello mushrooms so that you can stir it into the creamy velvety rice at the end just before you eat it. You also don’t have to use portobello mushrooms or mushrooms at all, I’ve experimented with zucchini, asparagus, and onions and I’ve found that as long as they’re roasted they all taste as though they belong in this recipe. After the wedding it’s been so special to have solitary time before I go back to work, making risotto (or any other food requiring copious amounts of slow stirring and quiet attention) and drinking leftover Cointreau with lemonade has been a time to recharge via introversion and I greatly enjoy the therapeutic nature of this recipe. 1. Preheat your oven to 400 degrees. Place the mushroom de-gilled side down on a rimmed baking tray and brush 1 Tbsp. of the oil on top of the caps. Scatter half of the herbs and salt over the oiled surface. Roast the mushrooms for 20 minutes at which point they should be taken out of the oven, flipped over, and given the aforementioned treatment with the remaining ingredients. Roast for 15 more minutes before removing from the oven and allowing to rest in their mushroomy juices. Once they are at room temperature they should be sliced into thin diagonal pieces. 2. In a large pan begin melting 1 Tbsp. of butter together with the olive oil over medium heat. Add the garlic and the onions, sauteing for 8-10 minutes until soft. 3. Stir the Arborio rice into the pan and combine until the rice becomes coated in the buttery oil mixture. Carefully stir in the white wine or vermouth and begin stirring slowly until the wine has been absorbed into the rice. Continue this method with the vegetable stock, adding a scant cup of the warm stock at a time. At this point I like to add a Parmesan rind if I have it, this infuses the whole risotto with that nutty piquant loveliness without having to add more cheese. Fish the rind out towards the end of cooking. 4. As the risotto cooks and the stock diminishes begin tasting to make sure the rice is cooked just perfectly, it needs to be luxuriously creamy with just the slightest bite at the core of each grain. Once it’s reached the desired consistency take the risotto off of the heat and stir in the butter and grated cheese. 5. 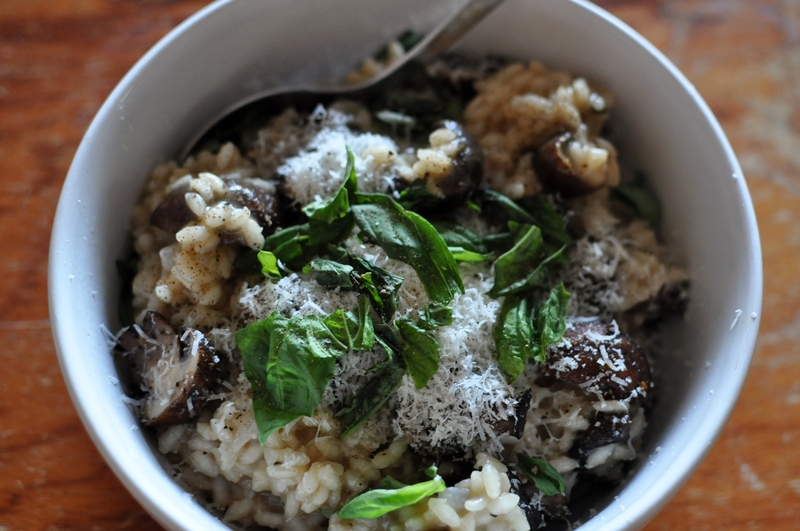 Add the mushrooms and their meaty juices to the risotto and give one or two stirs to combine. Serve mounded in bowls with the fresh herbs, extra cheese, and coarsely cracked pepper to taste. I’ve been listening to this song so much lately, it feels like almost all of the time. This isn’t unusual for Nick Drake, I think I listen to him every day, but when I hear this song I feel so emotionally elated and close to tears. Ian and I used this song for our first dance and in that moment I felt entirely free and deeply bonded to my very best friend. I’m so happy to have this beautiful reminder to listen to when I’m doing something as comfortable domestic as making risotto. The food you made for your wedding was absolutely incredible. The watermelon and feta salad was definitely a favourite of mine, and the chicken was so delicious. Everything was just incredible. Yes Jeanette and i agree that your food and wedding was Epic. beautiful wedding day sun and the extra special rain and lightning the next day to make one appreciate how you made that warm night happen. The dancing was fun playing like a kid with the glow sticks, hanging with your young friends and that cheese. Who cut the cheese? Your mom was so nice. What a joy to talk with her. Going to bring the young nieces out camping next week and i am going to have them help me whoop up this dish. Glad your back blogging and i will also put renewed effort to cook all your ideas up. Thanks again for inviting us to share your dream Ian and Ashley.